While there are large-scale diseases with varying degrees of manageability, on the day-to-day level the human body can still be pretty unfair to its inhabitant. I say this with full acknowledgement of my privilege – that is, I am sound enough of body. I mean your intentions going one way and your body going another. Like when I wet my pants on the first day of school. My teacher didn’t exactly give off kindly, benign vibes, and while I’d asked where the toilet was, I didn’t understand the answer. Also didn’t have the life skills at five years old to ask her to clarify her response, so…yeah. On the upside, I’d like to think I showed an early propensity for quick-wittedness when I offhandedly advised that it had been raining the night before, hence the puddle. But what’s got me thinking about this, is that it’s currently 5.30am. Not that shocking an hour really. But I’ve been absolutely, no-turning-back awake since 3.45am. Not for want of trying to sleep. My brain started getting stupid anyway. Like I’d be imagining rain on the roof and being all nice and calm, drifting away on a floating bed – suddenly my brain would insert into this lovely scene an enormous insect, a particular insect that terrifies the heck out of me and whose name I’m not even going to utter on this page. My brain did this about five times while I lay there in cold-then-hot discomfort, my normally reliable pillow becoming flat and concrete-like…when I checked my phone and over an hour had passed, I accepted there was not much I could do about it. So here I am. Luckily I had the foresight yesterday to bake some banana bread, a warm pillowy slice of which I am confident will provide untold comfort. Banana bread always seems like a rather lovely thing to me, perhaps because I associate it with the banana bread that shy, lonely Charlotte Johanssen brought over for her the Ramsey family in Babysitters Club #13: Hello Mallory, while the majority of Stoneybrook ignored the newcomers, quite racistly. 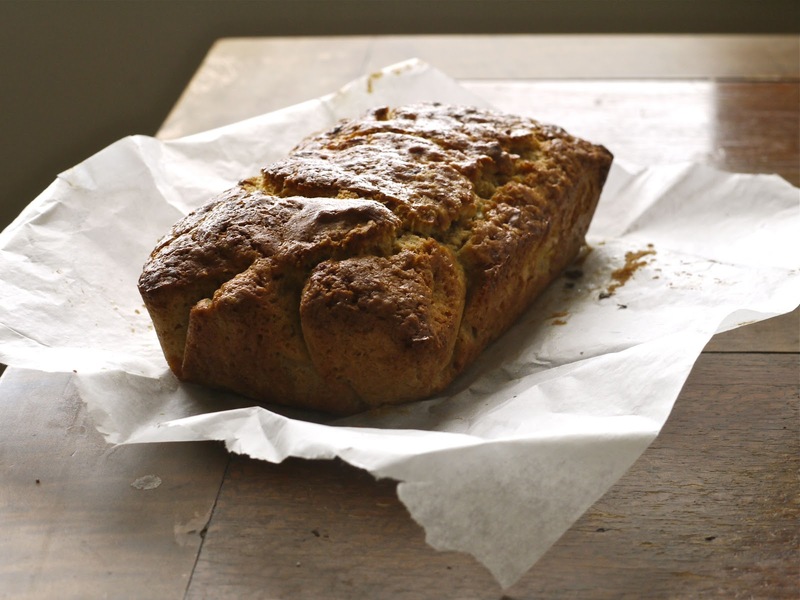 While I didn’t exactly know what banana bread was at the time – we would’ve likely called it loaf cake in New Zealand – something about its compact, sliceable practicality all wrapped in tinfoil and carried over by Charlotte conveyed the sense of neighbourly friendliness better than any other food could’ve. 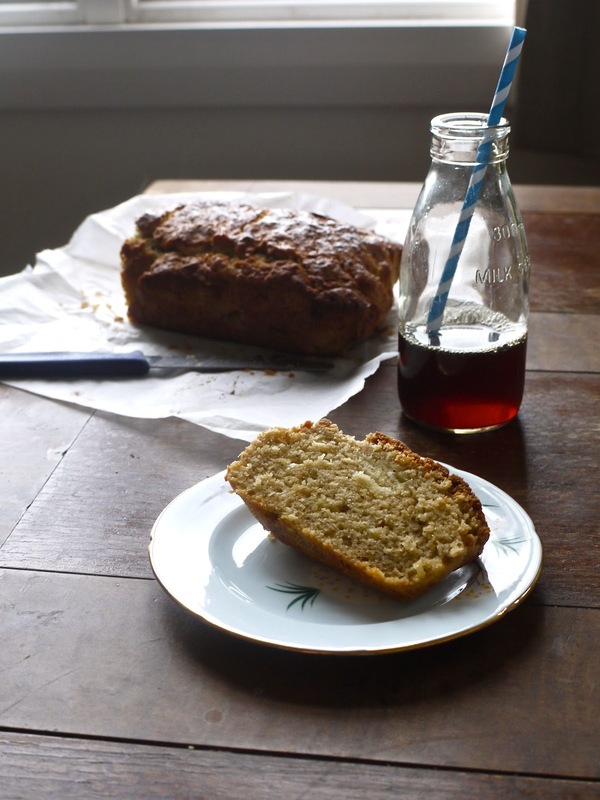 This is, kinda bafflingly, the FOURTH time I’ve blogged about Banana bread (Nigella’s beautiful recipe in 2008, and then in 2010 a vegan recipe and a highly recommendable Banana-lime Palm Sugar Loaf) and yet this new recipe still has its rightful place. Oh and I say ‘bafflingly’ because I can’t believe I’ve only just now brought up the Babysitters Club connection. 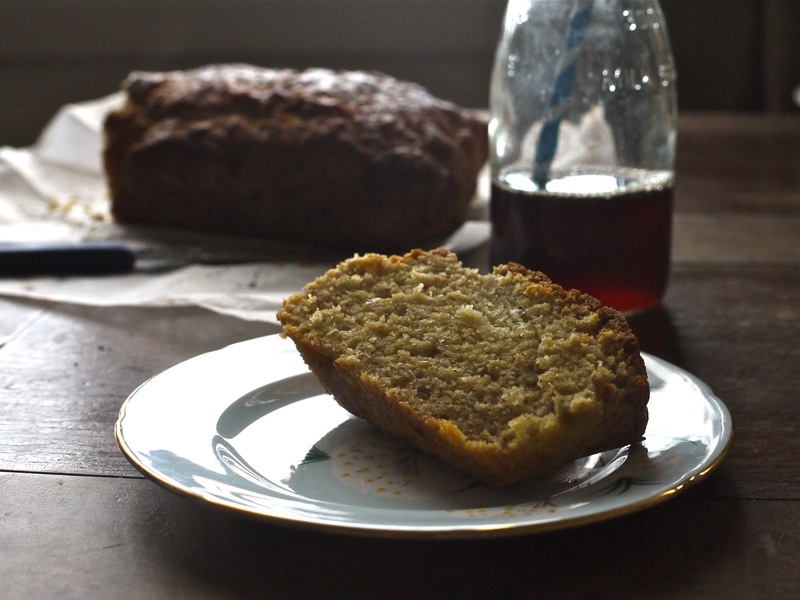 Four banana bread recipes itself is not baffling. What’s this one bringing to the table though? 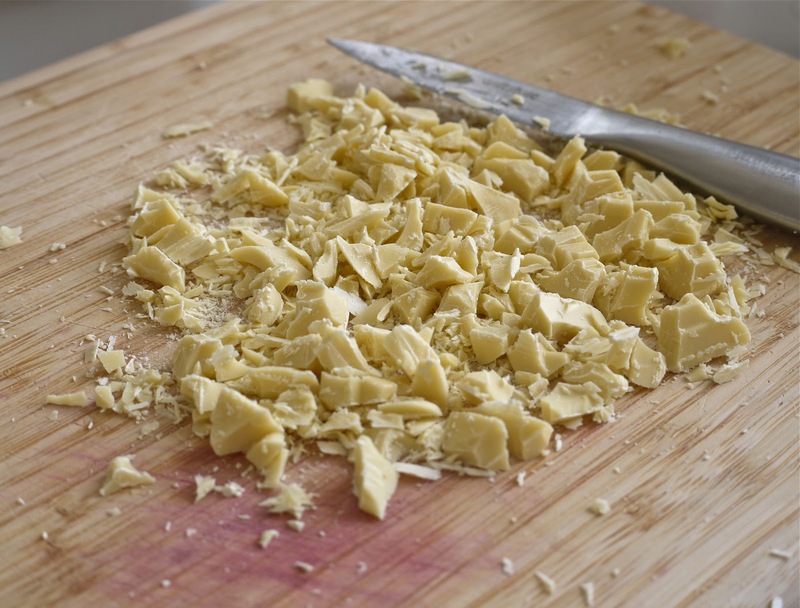 It’s simple, it’s strewn with white chocolate, and it has the snuggly scent of cinnamon. It’s also gluten-free, if you want it to be. Adapted somewhatish from a recipe in Meat-free Mondays. That book just won’t quit! Set your oven to 180 C/350 F and beat the butter and sugar together till creamy and light. Beat in the eggs, then fold in the bananas and white chocolate. Finally, sift in all the dry ingredients and fold them in gently. Tip the batter into a paper-lined loaf tin, and bake for about 1 1/4 hours. Something about the magical properties of cornflour make this light, puffy, and with a crisp yet mouth-meltingly tender crust. There might be more to it than that, but I’m pretty sure it’s the cornflour. While I’ll stand up for white chocolate’s deliciousness any day, sometimes being paired with a spice only makes it more delightful, and this is verily the case with the cinnamon. Its warm mellow fragranced-ness against the shards of creamy sweetness is brilliant, and makes me want to pair white chocolate and cinnamon together again in other baking. And soon. Um, yes, that is a glass bottle with a stripey straw in it. Guess what’s in the bottle? Iced coffee. Part of me is all “but it’s so pretty” and the other half is saying “Ugghh this is so blogger-y”. As always, to prove to myself that form over function could still provide a function, and I wasn’t just using props in my photos for the sake of it, I drank that coffee through the straw. It gave the already fruity, complex brew distinct notes of warm cardboard. But, as Leslie Knope said when she married off two male penguins to each other at the zoo: “I firmly believed it would be cute”. I think I need to stop guilting myself out over this. Speaking of cute, no sooner had I expressed a stunted desire to start drawing again in a recent blog post, than did appear a 31-day drawing challenge on the internet. Yay for the internet! Specifically I saw it on Instagram, the photo-sharing app, and so that’s where I’m posting all my daily drawings. 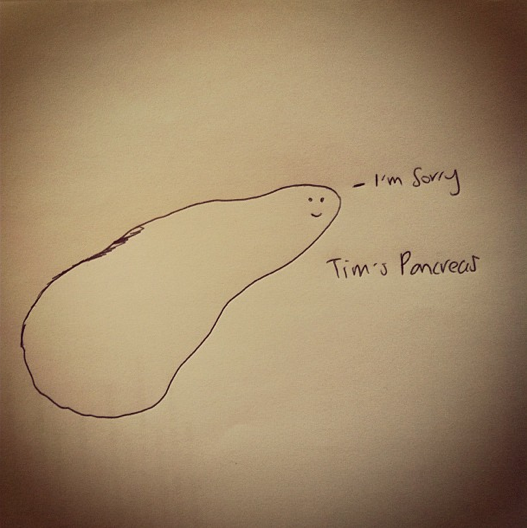 You’re welcome to check them out here (just look for the photos that are of drawings), but to lure you in, here’s my keenly sensitive and profoundly artistic rendering of Day 3’s challenge – an internal organ. And look, here I am at 6.45am! A blog post under my belt, and the day’s hardly begun. I think I’d still take the sleep though. Fingers crossed for tonight. Which is feeling a long, long way away – oh, did I mention it’s Monday? Cruel, cold Monday? 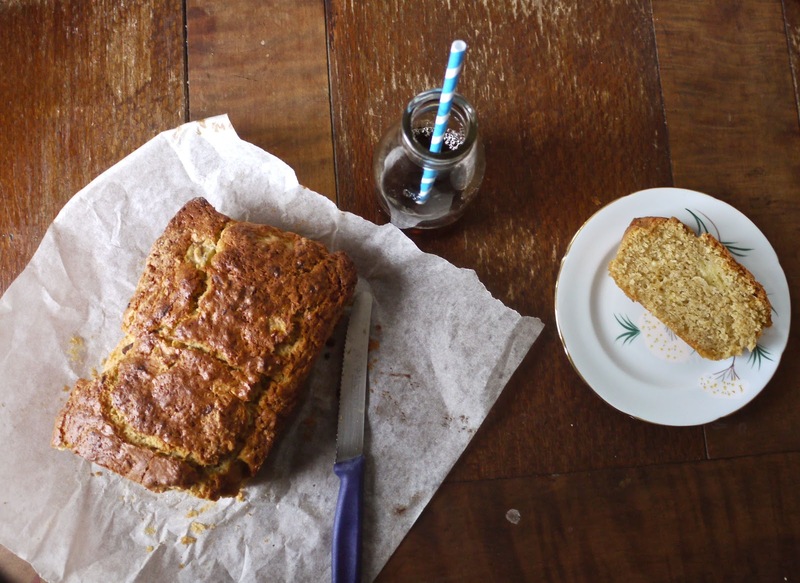 Thank goodness for banana bread, hey? Title via: I feel like there should be like, an airhorn going off or a balloon drop every time I use a song from RENT (which this blog’s named for) in the title of a blog post too. If I keep making banana bread I’m going to run out of title options, but for now kindly revel in the unspeakably glorious joy that is Angel’s big number, Today 4 U, performed with alacrity by Wilson Jermaine Heredia. My capacity for being obsessed with songs is boundless. Boundless, I tell you. So the fact that I listened to Marina and the Diamonds’ Shampain almost literally a million times this week shouldn’t surprise you. Monkees, Last Train to Clarksville. RIP Davy Jones, heartthrob. Next time: whatever it is, let’s hope I’m telling you about it on more than three hours of sleep. Banana and white chocolate…yummy combination!! yum yum yum yum yum!! I would like this in my belly right now! Yum Yum white chocolate cinnamon and banana bread! Great combo! My dearest, darling, fellow-insomniac, BSC-loving, sweet-tooth, darling darling friend. Hugs for the scary frustrating miserable lonely dark nights, steadily getting anxious about how you'll cope with the next day and fearing you won't sleep again the next night. Our stupid, stupid brains. But at least we can have the comfort of so often being in it together. Sweetest cake-filled dreams for the rest of the week, Laura! The rest of the town was definitely racist in BSC #13! Good thing they chilled. I feel so very grateful that I rarely have trouble sleeping, but my body definitely makes me pay by making problems out of nothing, i.e. sicknesses all the time. Yeah…nah…am having a competition hiatus. But thanks Mum. Thanks 🙂 sometimes I'm very serious with the assignment, I promise! If I wake up in the middle of the night and I start imagining things that it, no way of sleeping….huge insects brrr! I haven't had much time for catching up on my blog reading lately, but I'm always happy when I come back to your blog & read all your interestingness. I've come to the realisation that I will never have the way with words that I'd like to. Oh well, what can you do (except practice. I don't think I have the discipline for that in my life right now). Looking forward to catching up on the rest of your blog posts! Off I go! I made some Rent references in my post today as well! LOVE that musical. And that you referenced the Baby Sitter's Club…I amazed you remember it in that much detail! One can never have too much banana bread in their life. Especially not with white chocolate studs in the middle. I've had those exact same thoughts when I spotted the same cute straws at the kitchenware shop… haha, we are so kiwi.